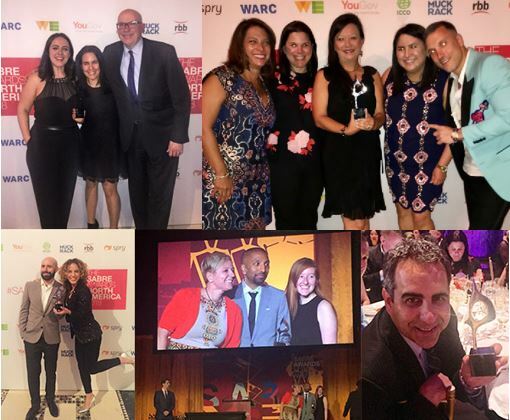 New York – May 2, 2018 – Weber Shandwick, one of the world’s leading global communications and marketing services firms, was recognized with its clients across 10 categories at The Holmes Report’s 2018 North America SABRE Awards in New York – making the agency one of the most award-winning firms of the night. Weber Shandwick was named Canadian Agency of the Year, celebrated for five years of double-digit growth in the region. The firm’s work with Royal Caribbean International for its Eclipse the Eclipse campaign was named one of the top 5 campaigns of the year. Weber Shandwick was also recognized in the PR Agency Citizenship category for its efforts to connect displaced families in Mexico City with hosts following the earthquake that rocked the city in September 2017. The firm was also recognized as one of the top five best large agencies to work for. The North America SABRE Awards, selected from more than 2,000 entries, recognize superior achievement in branding, reputation and engagement. Agency of the Year recipients are determined after an extensive research process involving more than 150 submissions across the United States and Canada. The Holmes Report pointed to several driving factors in awarding Weber Shandwick the Canadian Agency of the Year distinction, including the firm’s growth, its leadership position in corporate reputation and risk management, and its work for many of Canada’s most iconic brands, including Royal Bank of Canada, Air Canada and Canadian Tire, as well as several multinationals operating in the country. The North America SABRE Award recognitions are among several honors earned by Weber Shandwick in 2018, including being named PRWeek’sU.S. Agency of the Year for the fourth consecutive year and being designated an Ad Age Agency A-List Standout for the second year running. Weber Shandwick was also named The Holmes Report’s Global Agency of the Year in 2017 and PRWeek’s Global Agency of the Year for consecutive years (2017, 2016, 2015).